Recently I bought a bunch of chicks – three different breeds as I have two purposes in mind. I got Australorps for egg-laying. These black birds have been known to lay 300 or more eggs a year, and my experience with them in the past is that they will supply our family with all the eggs we need and then some. I also got some Delawares, an older breed that isn’t seen very often any more, and some Buff Cornish. I want to try a cross between the Delawares and the Cornish to see if I can come up with a meat bird that will breed true and have more vitality than the standard commercial Cornish Cross. Anyway, I’ve had forty-eight baby chickens in the old dog house that has been pressed into service as a chicken brooding pen, and they’ve done nicely for several weeks. They finally got to a size where I thought it was safe to let them out without having to worry about whether they would sneak out through the wires, and today was their first day in the big wide world. 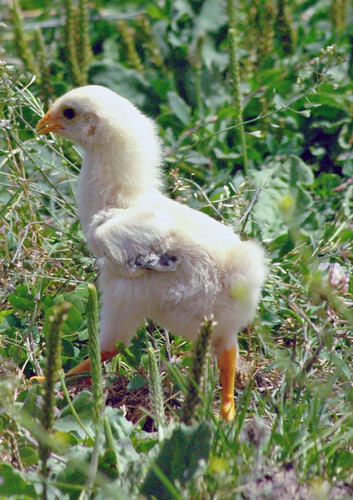 Chickens, like people, vary in their capacity to handle new experiences. I opened the dog house door and stood by to watch, just to make sure there weren’t any catastrophes. The Delawares were the first to poke their heads over the sill and take a sniff of fresh air. Then one jumped up on the edge of the doorsill and leaned just a little too far forward – kerplop! While he was getting back on his feet, another hardy soul followed, flapping madly: “Lookit me, I’m flyin – oof!” A third tried to walk down the ramp: “Hey, this isn’t so bad, I’ll just – whoops, I’m sliding!” Ten minutes later, about half of the chicks were outside, running madly back and forth, flapping their wings, taking dust baths and arguing over assorted tidbits, while the less adventurous remained in the coop, pacing back and forth along the wire and nervously commenting on the mayhem outside the cage. I decided to let them get on with it at their own pace and went off to feed the pigs. By the middle of the afternoon, everyone had managed to get outside by flying, falling or osmosis. I took them fresh water, some more food and a little alfalfa hay. They were having a ball, poking into every corner, chirping madly and trying to see if they could manage to get off the ground by jumping up and down while flapping their wings double-time (they couldn’t, but they didn’t quit trying). As dusk fell I went out again. Loud cheeping, much distress. “Where’s our house? Somebody hid our house! Our house is LOST!” If they had been small children, there would have been great tears rolling down their feathery little cheeks. None of them had been able to figure out that all they had to do was walk up the ramp and into their house. They had huddled in a corner, pretending that was the same as their sleeping spot inside the chicken house. So I spent about fifteen minutes catching chicks and setting them in their house. The little birdbrains were asleep before I got the door latched. Just as well, tomorrow will be another big day.